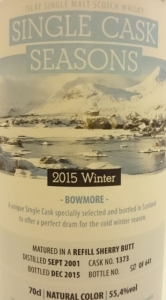 As promised yesterday, here is my review of the Bowmore 2001, which is the Winter 2015 expression in the ‘Single Cask Seasons’ series. Single Cask Seasons is a bottling series from independent bottler Signatory Vintage for German whisky importer Kirsch Import. The goal of this series is to find a whisky that matches the season of the year. As for the pricing… around 100€ for a 14 years old expression? A bit ambitious if you ask me, especially because the excellent Clynelish 1996 (Spring 2015) did cost only 90€. Where is it all going to end? Smoky but not that peaty. Notes of medicine and iodine. Pretty dry with dried logs, dried cloves and dried oranges. Some fruits, most notable smoked banana chips. Very slight traces of sherry and vinegar in the background. A bit of lavender perfume, too. Gets sweeter with some time in the glass. Vibrant and warm but way, way less sweet than expected. 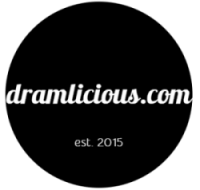 Smoked cough syrup, and then sherry, sherry and even more sherry. Sugared citrus peels and sweet oranges. Gets drier towards the end with dried oak and old leather. Medium with a fruity sweetness. Ember and charcoal. Very yummy although the taste is completely different than the nose would suggest.